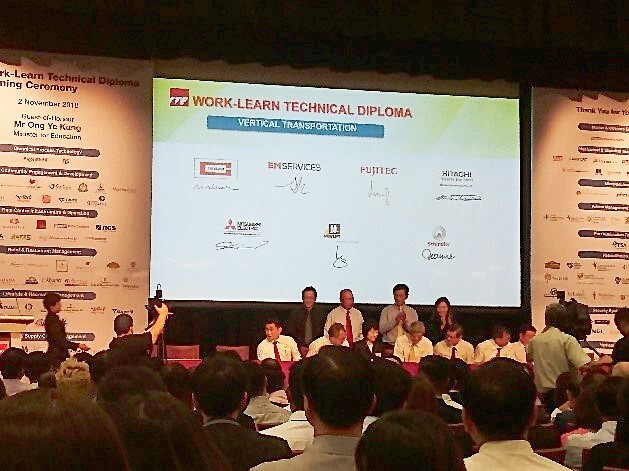 The Insitute of Technical Education (ITE) first launched the Work-Learn Technical Diplomas (WLTD) in April 2018, and its objective of the program is to give fresh graduates from Post-Secondary – Polytechnics and ITE – a head start in careers related to their discipline of study. That will include the development of skills and knowledge acquired in school to support their transition into the workforce. EM Services joined hands with ITE on 2 November 2018, with Dr Lai Weng Chuen, MD of EM Engineering, representing the company in the signing ceremony held at ITE Central, with Minister of Education Mr Ong Ye Kung as the Guest-of-honour. EM Services will be developing and designing a WLTD in Vertical Transportation collaboratively with ITE; the course is commencing in April 2019. The curriculum will be carried out in two components; Off-the-Job Training, which consists of theory and practical lessons at ITE and On-the-Job Training at EM Engineering, which covers the application of the acquired knowledge in daily job tasks under a qualified supervisor in an actual work environment. EM Services is excited to be a part of this programme and believes in offering more opportunities and pathways for people to continue to upgrade themselves and be better equipped with knowledge that could help with creating a better environment for all.